Nigeria's Former Aviation Minister, Femi Fani-Kayode on Saturday said he will personally lead a campaign against Mr. Atiku Abubakar, the Peoples Democratic Party's Presidential Candidate should he fail to meet the expectations of Nigerians after being elected. 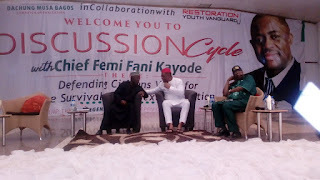 Fani-Kayode during a live televised public discussion in Jos, the Plateau State capital said he stands for justice, equity and fairness for all Nigerians regardless of ethnicity or religion. The Presidential hopeful is therefore expected to address issues of marginalization of Christians and minority tribes in the country or face the same opposition as the current President, Muhammadu Buhari, FFK said. The position of the popular activist were Sunday reechoed by a group of Northern Nigerian Pastors who declared support for Mr. Abubakar. The Areas Christians and Pastors Association said the present administration of Mr. Buhari has failed to provide equal opportunities for all Nigerians especially Christians. Mr. Abubakar is therefore expected to resolve the imbalances created by the present government, ACIPA President, Rev. Luka Shehu said at a news briefing. Some of the organization's concerns which he said have been communicated to the Presidential hopeful in a letter include promotion of social justice, rule of law and freedom of religion, he said.